The increasing importance of repair techniques in the current heart valve surgery using less invasive surgical approaches is a very stimulating development in the contemporary cardiovascular medicine leading to the continuous expansion of the surgical portfolio. Hamburg Valve Repair 2018 will be dedicated to the cutting-edge developments and techniques in the minimally invasive and reconstructive therapies of mitral and aortic valve disease. We strongly believe that cardiac surgeons and cardiologists involved in the treatment of patients with structural heart valve disease should be familiar with modern reconstructive approaches in the current heart valve therapy and adopt the principles of valve repair techniques to provide the best available patient care. 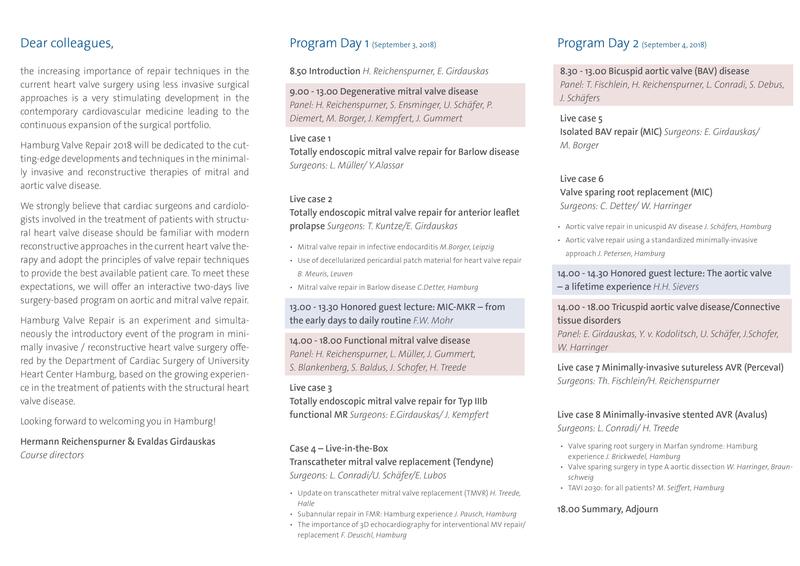 To meet these expectations, we will offer an interactive two-days live surgery-based program on aortic and mitral valve repair. Hamburg Valve Repair is an experiment and simultaneously the introductory event of the program in minimally invasive / reconstructive heart valve surgery offered by the Department of Cardiac Surgery of University Heart Center Hamburg, based on the growing experience in the treatment of patients with the structural heart valve disease.